Afghans who returned to their village in Deh Sabz from Pakistan, receive food supplies of fortified wheat flour, pulses, vegetable oil and salt from WFP. The United Nations World Food Programme (WFP) has launched a nine-month operation to assist Afghanistan in dealing with the growing numbers of returnees from Pakistan, as well as and internally displaced people, by providing emergency food and funds. Thousands of refugees are now crossing the border every day at the main entry point of Torkham, in eastern Afghanistan, some with identity papers and some without. According to WFP, more than one million people are expected to be on the mover across the country by the end of the year. In cooperation with Afghanistan’s Ministry of Refugees and Repatriation, WFP intends to set up a digital registration platform at the border to capture the returnees’ biometric data using SCOPE, the agency’s beneficiary management application. In addition, WFP is monitoring the situation using mVAM tool, a vulnerability assessment mapping, to allow the community leaders to report any shifts in the emergency situation over their mobile phones, and to ensure that no one is left behind. But a successful response depends on adequate financing. “We need sufficient and timely funds in the coming weeks and months to ensure that we can help returnees as rapidly and efficiently as possible,” stated Mick Lorentzen, WFP’s Country Director in Afghanistan, ensuring that a quick and focused response to the crisis will prevent more people from falling into chronic food insecurity. WFP and other United Nations agencies are working closely with the Afghan government to increase the capacity of humanitarian response and meet immediate shelter, sanitation and food needs, which also required an urgent appeal for $152 million. The agency is providing food and cash assistance for 163,000 undocumented returnees, 200,000 documented returnees, 150,000 internally displaced people, and 35,000 refugees in Khost and Paktika. WFP has also increased its assistance in eastern Afghanistan, and is now providing support to prevent malnutrition to more than 23,000 toddlers from returnee families. The goal is to support 550,000 people through emergency operation. WFP has received very generous and timely contributions from Australia, Belgium, Italy and Norway. Operational costs are estimated to be $66.8 million, only 12 per cent of which has thus far been met. 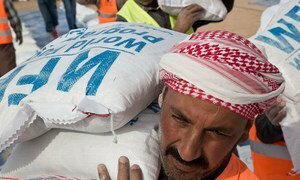 The United Nations World Food Programme (WFP) has provided food assistance to some 100,000 people fleeing the intensifying conflict in Mosul, including a distribution on Sunday to 25,000 people in Gogjali, while also working tirelessly with its partners to reach families that remain trapped in Mosul city and newly recovered areas.